Tseyang Gyatso was born in 1683 in Mon Tawang (in modern Arunachal Pradesh, India) to Lama Tashi Tenzin of Urgyanling, a descendant of the treasure revealer Pema Lingpa, and Tsewang Lhamo, a Monpa girl hailing from a royal family of Bekhar Village. 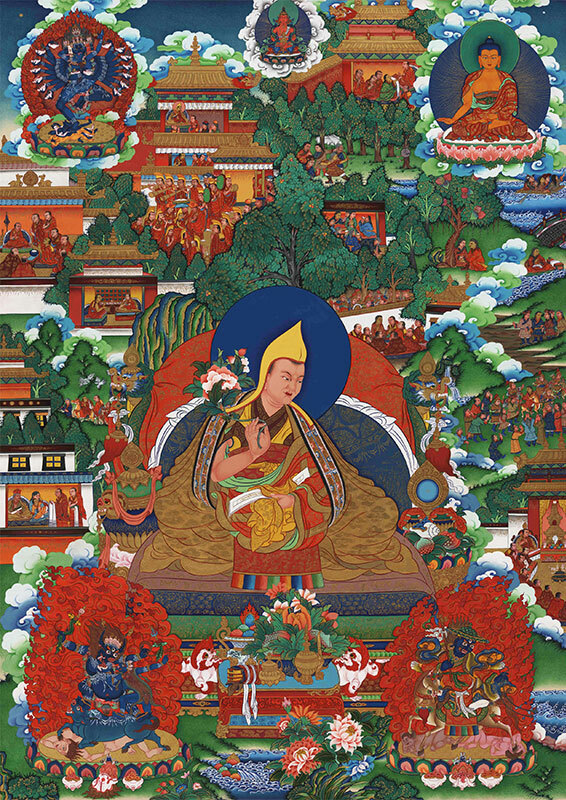 Although the 5th Dalai Lama had died in 1682, the Regent Desi Sangye Gyatso kept his death a secret – partly to continue the stable administration, and partly to gain time for the completion of the Potala Palace. The search party finally concluded that the 6th Dalai Lama was born in a distant Southeastern valley whose name ended with “ling”. They searched all places ending with “ling”, including three in Tawang – Urgyanling, Sangeling and Tsorgeling before discovering him in Urgyanling. The 6th Dalai Lama was brought to Lhasa in 1697, at the age of fifteen after which Desi Sangye Gyatso sent a delegation to the Kangxi Emperor of Qing China to announce that the 5th Dalai Lama had died and the 6th had been discovered. The regent invited Lobsang Yeshe, the 5th Panchen Lama to administer the 6th Dalai Lama the Bikkhu or novice vows at Nankartse and named him Tseyang Gyatso. In October 1697, Tseyang Gyatso was enthroned as the 6th Dalai Lama. Tseyang Gyatso soon made it clear that he didn’t intend to remain a monk. At eighteen, he visited the 5th Panchen Lama in Shigatse to renounce his monk vows in lieu of taking the full Bikshu or Gelong vows, which was expected of him as his age. He then enjoyed a lifestyle of drinking, seeking the company of women and writing love songs that later became famous. Though Tseyang Gyatso rejected life as a monk, he retained his position as the Dalai Lama though he chose to dispense with the trappings, wearing layman’s clothes and walking rather than riding or traveling in the state palanquin. He spent his time in parks and at night, wandered in the streets of Lhasa, drinking wine, singing songs and pursuing amorous relations with women. He eventually retreated to live in a tent in the park near the northern escarpment of the Potala Palace and gave up giving public discourses which were expected of him as a Spiritual leader. Using the Dalai Lama’s behavior as an excuse and with the approval of his ally, China’s Kangxi Emperor, Lha-bzang Khan, Khan of the Khoshut Mongols, plotted the assassination of the regent Sangye Gyatso and kidnapped the Sixth Dalai Lama, deposing him in 1706. He later installed a 25-year-old monk, Ngawang Yeshi Gyatso, as the “true” 6th Dalai Lama in 1707, claiming that he, not Tseyang Gyatso, was the true reincarnation of the 5th Dalai Lama. The Gelugpa dignitaries and the Tibetan people rejected Lha-bzang Khan’s installation of Ngawang Yeshi Gyatso and continued to recognize Tseyang Gyatso as the true reincarnation of the Great 5th.